Happy Monday! Wow...what a weekend we had here, BUT before I can share it, I have too many photos to edit and not enough time. 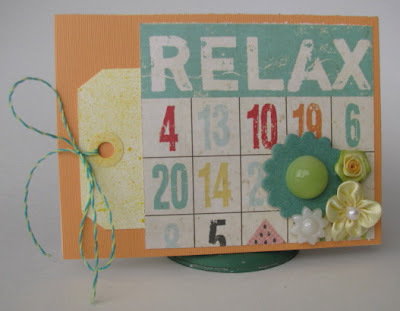 So, for now I will share my cards created with the June Polka Dot Whimsy kit. I don't really consider myself a card maker. I am a scrapbooker. However, every so often products come alone that make me want to use up every last scrap. The June PDW kit is a great example of this. There was one sheet of patterned paper in the kit by My Mind's Eye. It was pretty, but floral, and oh-so-not-me. But, I didn't want to waste it. It matched a sheet of (orange) cardstock in the kit perfectly, so I immediately knew I'd get a few cards out of this kit. I made two with it. One is simply "4 you" while the other is "Have a Lovely Day" thanks for some help from an October Afternoon sticker. I LOVED the orange gingham ribbon from the kit. While I really like the stamped tags that usually come in our kits, I usually find the images hard to use with my photos. I tend to cut them or flip them over. This month, I added one to a card by tucking it behind a scrap of a "bingo card" from a sheet of patterned paper by Simple Stories. Then I added some of the kit's "doo-dahs" and my card was complete. (I added some Pink Paislee twine to the tag, too.) This made a great birthday card for our niece. 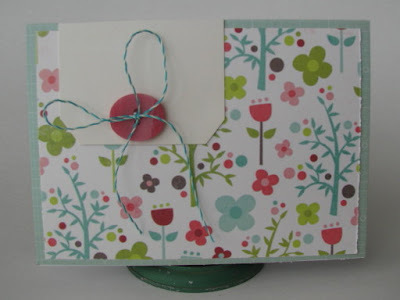 The next card is an example of how to make a quick any occasion card using the partial tag method mentioned above and another scrap of floral paper. (The backside of this floral was a great green diagonal that I used quite a bit!). I can always go back and add a sentiment to the card before I send it. Next up...Kevin was invited to a birthday party for TWO of his teammates. I had the perfect scraps to make a couple of fun cards for two 10 year olds. I cut the hats out of a sheet of My Mind's Eye paper and adhered them with pop dots. The sentiment stickers were off a sheet by October Afternoon. I layered some scraps and then drew in some lines to mimic hand-stiching. While cleaning up the other day, I noticed I had several partial kits left over. Since creating these six cards was a rather painless process, I plan to pull them out and see how many cards I can make with them. Such cute cards Amy, love them! Your cards are always so cute and I haven't met another soul who can get as much mileage out of a kit as you! Great job Amy!